The Jardin des Paradis is located in the beautiful village of Cordes sur Ciel in the Tarn department in the south west of France. The Jardin des Paradis, Paradise Gardens, was created by Eric Ossart and Arnaud Maurieres who are both well known garden designers in France. The Jardin des Paradis has taken the idea of 'paradise or Islamic gardens' as its inspiration and created this beautiful garden which stimulates all five senses in the 'paradise' tradition. 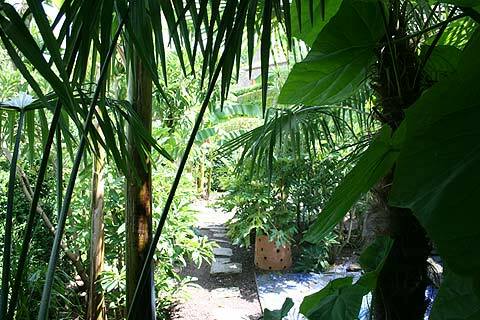 The 2500 square meter plot houses a number of gardens on different terraces. 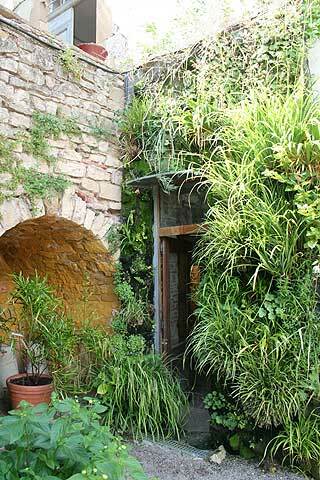 One of the first gardens you enter is 'Le Cloitre' which has a large tower packed with plants which was created by Greenwall. These vertical walls of plants also appear attached to the main building and mean that even the buildings are verdant with interesting plant features. Leaving the cloitre you appear at the top of a staircase leading down to the main gardens which are on terraces below. 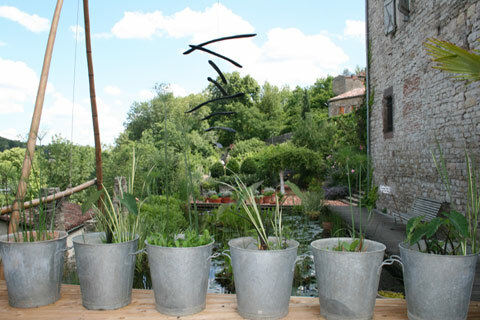 Here you will find perhaps the most famous feature at the Jardin des Paradis which is a series of galvanize-tin buckets down the edge of a staircase where water trickles gently from one to the other forming a very original water feature. This is a simple but very striking feature seen against a backdrop of the beautiful midi-pyrenees scenery and the palms and fig trees growing next to the staircase. The first gardens you see at the bottom of the staircase are inspired by a passion for Persian carpets. 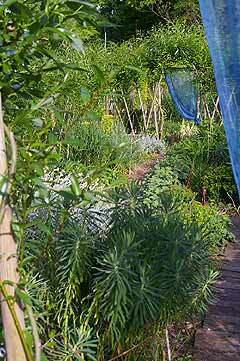 Annual plants are woven into 'living carpets' with a pattern created by the repetition of a number of annual pants. Zinnias, verbenas and salvias are often used in these creations. One of the key gardens of the Jardin des Paradis is its large potager, a vegetable garden, where flowers are mixed with vegetables to make a garden pleasing to look at as well as productive. 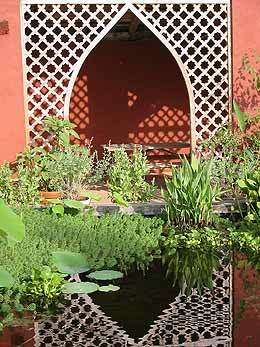 Continue wandering through the gardens and each one has something to catch your eye, be it excellent plant combinations or a structure woven in willow or the lovely pots reminiscent of those on Andalusian patios. Scent is not forgotton either and many plants have been incorporated for their wonderful smells. Water is very important in Paradise gardens and there is a magnificent pond with lotus and lily plants as well as hundreds of frogs! Another pond has some beautiful koi carp swimming leisurely in its clear waters. The gardening style is a natural one where mulching and composting are preferred to the use of fertilizer. 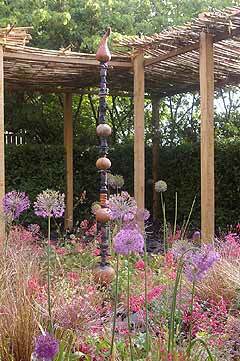 The garden has been given the 'Jardin Remarquable' distinction in 2004. 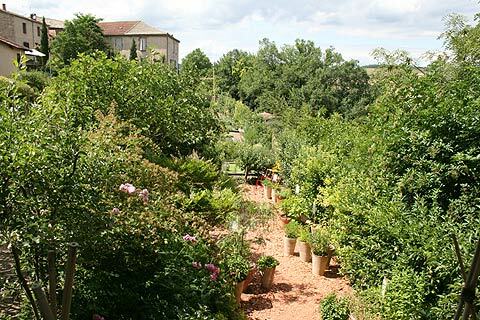 The Paradise Garden is garden is situated in the medieval village of Cordes sur Ciel, a wonderful village to visit in the Midi-Pyrenees region of France. Cordes sur Ciel is about 20 minutes from Albi and 1 hour from Toulouse. Park your car in the centre of Cordes sur Ciel and then walk to the garden as it is on the edge of the town and has not parking. As well as the garden there is a small museum displaying unusual seed pods at the garden and also a small nursery area where some of the plants you see in the garden are available to buy. The entry price is 5 euros for adults and 3 euros for children. Admission is free for under 6s. 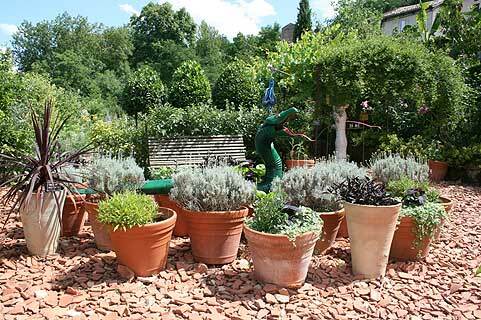 The lovely Jardins de Quercy are not far away in Verfeuil sur Seye. 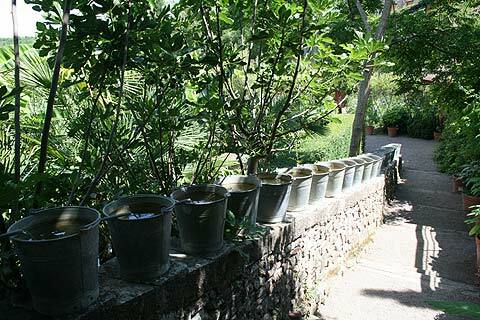 The Jardins des Martels to the north of Toulouse is one of our favourites in the area.